FARM KING HAS BEEN BUILDING RELIABLE AGRICULTURAL AND COMMERCIAL SNOWBLOWERS FOR MORE THAN FOUR DECADES. What sets the Propeller Series apart is the aggressive new propeller blades on a paddle-style auger that maximizes performance in extreme conditions with heavy, packed and wet snow. The rapid rotation of the auger with the propeller blades breaks down larger pieces of snow as it enters the machine and moves toward the fan, providing a smoother flow of snow into the fan. 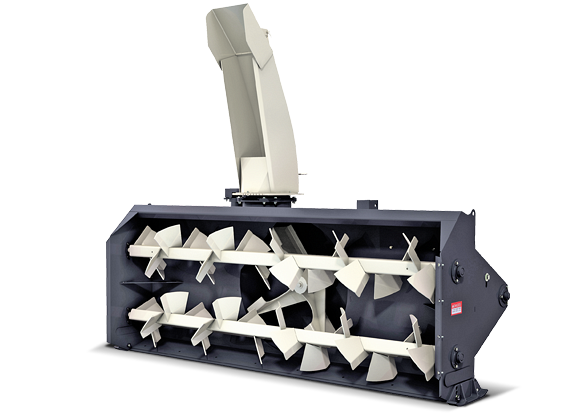 Allied Snowblowers are available in sizes ranging from 50" widths and up. (Heavy-duty widths are also available ranging from 96" to 120"). Cutting Width 50" 60" 66" 74 " 84" 96" 108" 120"
Cutting Height 24" 24" 24" 25" 25" 36" 41" 41"